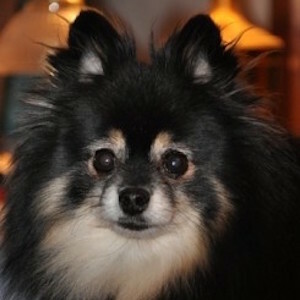 Taz is a Black and Tan Pomeranian. In 2007, Susanne was contacted by someone who knew another North Star Therapy Animals team. The person was wondering if she knew anyone associated with Pomeranian rescue. Luckily for Taz, that was Susanne. Back then, she says she had no original intentions of keeping Taz when she took him in. However, Susanne’s dog – a middle-aged puppy mill rescue who had never before played with another dog – decided to play with Taz. At only 2 ½ years old, Susanne represented the 5th or 6th home Taz had had in his short life. Susanne gave Taz the new home and life he deserved. The pair became a registered therapy animal team, and today they visit regularly at the Ronald McDonald House – Twin Cities. In his free time, Taz loves to play with toys and will retrieve them when thrown. He also enjoys running at top speed around the yard.